Nestled alongside the White Rock location of Cane Rosso, owners Jacob and Lindsay Sloan are in the final stages of construction on their soon-to-be craft beer laboratory, a venture they've appropriately named On Rotation. Operating out of an elongated 3,200 square foot space, featuring views of the brewhouse and a bar pouring both their beer and the beers of others from 40 taps, On Rotation's name alludes to the experimental nature that will define the brewery's approach. Small-batch beers crafted on a 3-barrel system will be inherently limited in terms of their availability and, as you might have guessed, perpetually on rotation. While this might suggest you'll need to take up permanent residence in order to partake in the brewery's every pour, the Sloans have come up with a seemingly much more attractive option. Voting privileges on which beers will be produced in a special "Inner Circle" series. Regarding the "Inner Circle" line of beers, the idea is to let members choose which styles will be brewed as part of the in-house series. A description and tasting notes will be provided for different options, and a majority vote will determine which beer goes up next on the tap wall. 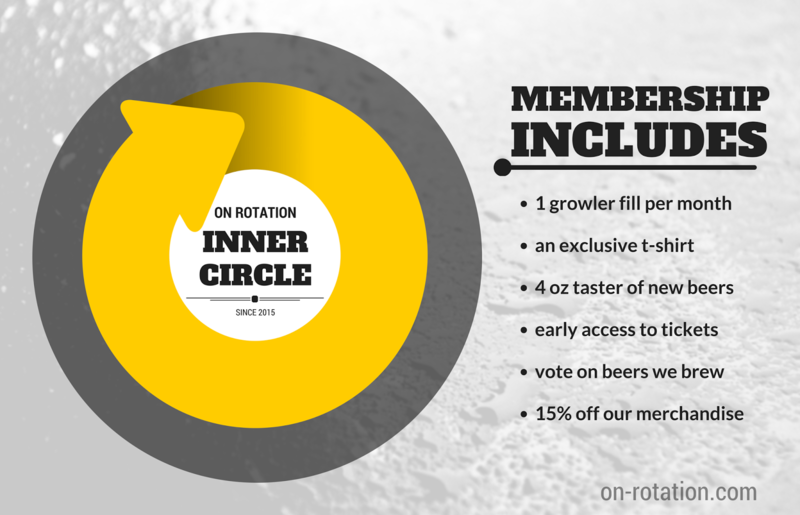 Pre-sale memberships will be available starting later this week on the brewery's website (on-rotation.com/inner-circle), with discounts offered for early adopters. Buy-in will increase every few days until it reaches a final price of $275, which will be the regular amount going forward. Memberships will run 12 months beginning on February 1 and ending January 31, 2016, with current members getting first dibs on renewing in subsequent years if it is determined that a cap is needed to ensure production will be able to meet demand. As for when the brewery will open, should final inspections go through a soft-opening could happen as soon as this weekend. On Rotation's house beers won't be in production as of yet, but they'll still have the aforementioned 40 brews on tap (roughly half local, half from out of state) for your drinking pleasure. An official grand opening will be scheduled once the Sloans are ready to debut their own beers, which as of now looks to happen sometime in late February.